Ice Cream and summer - the perfect combination! And now there is another perfect combination. International Delight and Cold Stone Creamery. Founder's Favorite and Churo Caramel - yum! They are also sponsoring a Pinterest Pin to Win Sweepstakes for a chance to win $400 towards throwing an ultimate summer ice cream social! 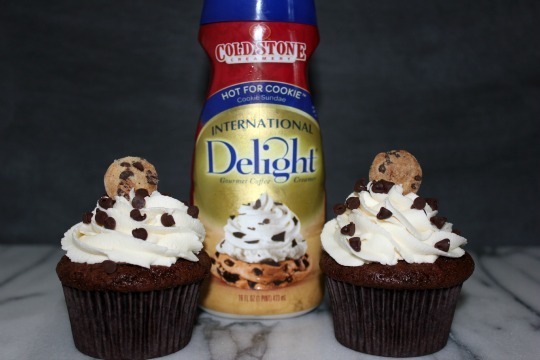 I'm sharing my Cold Stone Creamery Hot for Cookie Chocolate Chip Cookie Cupcakes. I replaced the water in the cake mix and milk in the frosting with Hot for Cookie creamer to give it that extra cookie taste. 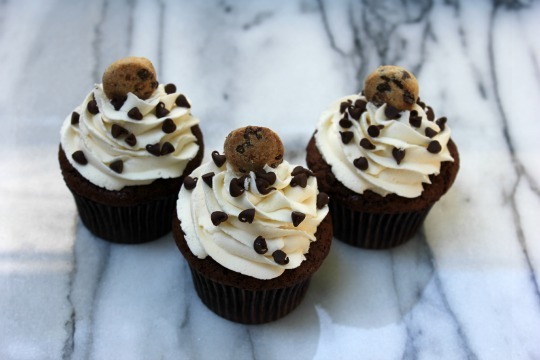 It tastes especially delish in the frosting! In a large mixing bowl combine cake mix, eggs, coffee creamer and canola oil with an electric mixer. Top with a mini chocolate chip cookie.